As I've shown in previous posts such as "Identifying Gradle Conventions" and "Evolving Gradle Build from Ant Build: Importing Ant Build File", significant information about a Gradle build can be gleaned by accessingGradle's APIs via Groovy. 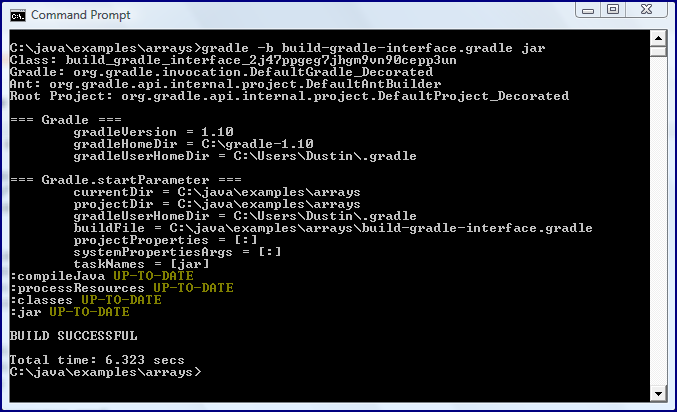 In this post, I look demonstrate accessing basic Gradle build details via the Gradle interface. 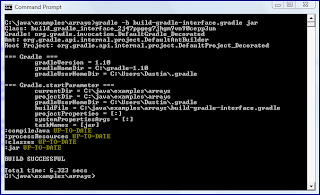 The org.gradle.api.invocation.Gradle interface is accessible in the Gradle build file via simply "gradle" [which implicitly corresponds to getGradle() in Groovy parlance]. The next Gradle build script listing shows a subset of the metadata information available via the Gradle interface. The above build listing and associated screen snapshot indicate that the Gradle interface provides metadata such as version of Gradle, the Gradle installation's home directory, and the Gradle user's directory. The Gradleinterface also provides access to an instance of StartParameter that provides further build start-up metadata details such as project directory, current directory, the name of the build file, project properties, system properties, and names of tasks that were specified for execution. There is significantly more information that can be gleaned about a Gradle build from the Gradle interface and this post only shows a subset of that information.